Déjà vu? Eh, a little bit. Don’t let that be a cause for concern, though: “Guardians of the Galaxy Vol. 2.” is full of the colorful action and endless wit that made the first film one of the Marvel Cinematic Universe’s best. Peter Quill (Chris Pratt) and co. are still as charismatic as they are wonderfully dysfunctional, and their idiot hijinks provide plenty of legitimate laugh-out-loud hilarity and some surprisingly apt dramatic moments. The sci-fi staples of epic space battles, daring escapes, larger-than-life baddies and universe-destroying stakes are all here: Like its predecessor, “Guardians of the Galaxy Vol. 2” is a better “Star Wars” film than most of the “Star Wars” films. There’s a lot to love here, even if the opening arc is fairly weak. The plot is jump-started by Rocket’s (Bradley Cooper) ill-motivated theft of some valuables from an underdeveloped and uninteresting group of aliens. 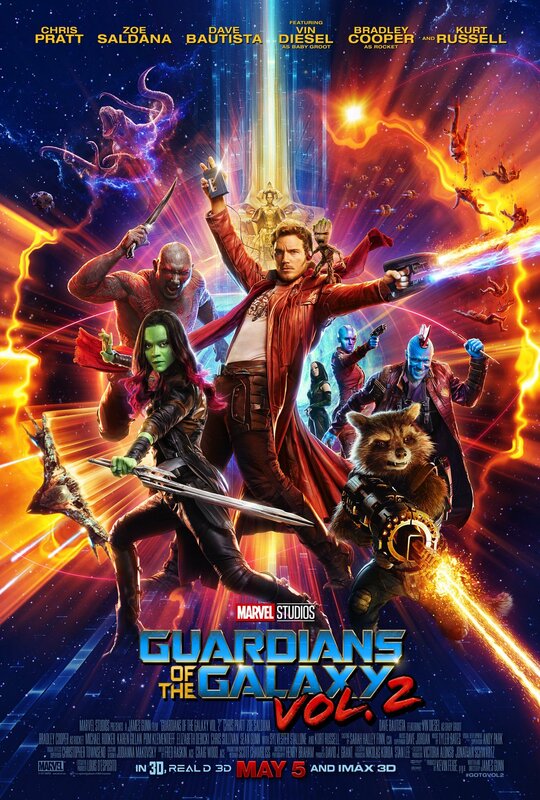 It’s a limp premise that makes the Guardians seem like dicks—and not the irreverent-albeit-lovable scoundrel types—and the petty scale of the conflict kicks off the story with less of a spark and more of a dull thud. It’s a good thing, then, that the latter two thirds of the film does nearly everything else right. Although “Vol. 2” only rarely matches the original’s gut-busting hysterics of Jackson Pollock painting jokes and Quill’s desperate dance moves, the vast majority of its jokes come remarkably close. While Quill and Gamora (Zoe Saldana) don’t have quite as many zingers this time around, presumably because they were the most developed of the Guardians in the first film, “Vol. 2” makes up for it in spades due to franchise newcomer Mantis and the increased presence of Drax (Dave Bautista), Baby Groot (Vin Diesel) and Yondu (Michael Rooker). A lengthy prison break featuring Baby Groot is certain to be one of cinema’s funniest moments of the year and one of the franchise’s best scenes in general. Elsewhere, Drax’s mix of ludicrous bluntness and moronic gullibility makes each of his lines absurdly entertaining. Whether the characters are talking, fighting or both, “Vol. 2” will have you laughing consistently throughout the film, which is no minor feat given its lengthy runtime. Particular credit should be given to Mantis, easily one of the franchise’s best characters in years. While it’s difficult to discuss the character in-depth without spoiling the plot, the character’s humorous innocence and goofy exchanges with Drax serve as some of the film’s best moments. Like “Captain America: Civil War’s Spider-Man, Mantis (Pom Klementieff) makes the most of her screentime with nonstop entertainment. That said some of the film’s more slapstick moments are to its detriment. When Drax is battered into trees at hundreds of miles per hour during a crash landing and emerges entirely unscatched, it’s just dumb enough to annoy and raise the question of why any of this matters if the protagonists are effectively immortal. These are the outliers though, and largely forgivable due to the sheer number of jokes that effectively hit home. “Vol. 2” is genuinely fantastic comedy, but it’s also impressively dramatic at times. Kurt Russell’s presence is expectedly immense, and what Quill lacks in nonstop quips and barbs is made for with a satisfying fleshing out of his backstory and history. Yondu and his gang of Ravagers also enjoy more screentime, and while plenty of great humor stems from that, the crew is given a respectable bit of depth and some real heart. The film’s primary villain—again, difficult to thoroughly analyze while avoiding spoilers—is one of the Marvel Cinematic Universe’s better ones. Admittedly, “Vol. 2” didn’t have a high bar to pass there, but the Big Bad is certainly better than the original’s Ronan. The final fight is also a visual and creative spectacle in the vein of “Dr. Strange’s” Dormammu standoff. Great stuff. Great stuff, indeed. “Vol. 2” is proof that the its predecessor wasn’t a fluke. There’s enough popcorn action to satisfy the summer blockbuster needs, just enough sci-fi and comic mumbo jumbo for the nerds and an endless stream of genuine whoops and warmth. This is another home run for Marvel and a fantastic film in general. Definitely worth getting hooked on this feeling.